Today you'll learn the pros and cons of vaping your weed vs. smoking it. You'll also learn whether vaping marijuana is ‘safe' and how you can vape in the safest possible manner. Potentially causes irreversible damage to our delicate respiratory system. Burning plants like marijuana causes the release of toxins, irritants, tar, and various carcinogens. When you smoke, you ingest all these harmful compounds into your body. Decades-long of research has proven that compounds found in smoke are extremely harmful to human health. Marijuana smoke contains at least 50 known cancer causing substances. The most well researched and documented is benzyprene, which alters gene P53, a tumor suppressor gene. Cannabis smoke contains many of the same carcinogens as tobacco smoke. And although no clear links have yet been found between smoking cannabis and cancer, smoking cannabis could increase your risk of lung cancer, exactly because it contains many of the same carcinogens as tobacco smoke. While some studies emphasize this last point that cannabis smoke could increase cancer risk, other studies conclude that there are no links between smoking marijuana and lung cancer. The bottom line is that the effects of marijuana smoke on cancer risk are far from conclusive at this point in time. So even though it remains unclear whether smoking cannabis increases your risk of lung cancer, it's a fact that smoking cannabis will damage your respiratory system in other ways. Vaping weed can be done in different ways (some early adopters vaped weed with a simple light bulb). But the most straightforward way is with a dry herb vaporizer that's specifically designed to vape weed. It delivers this vapor directly to your mouth, so you can inhale it. The biggest benefit of vaping vs smoking weed is related to health. Marijuana vapor contains significantly less tar, carcinogens, and other toxic by-products than marijuana smoke. Burning plant material creates a multitude of compounds that are harmful to human health. By vaping you reduce your exposure to these compounds significantly. But this doesn't mean that vaping your marijuana is 100% safe. Vaping doesn't reduce your exposure to harmful compounds completely. By vaping your marijuana you'll still get exposed to a small fraction of the toxic by-products that you would've gotten exposed to if you smoked. How much vaping exactly reduces your exposure to harmful compounds remains unclear, but research of Public Health England, an executive agency of the Department of Health and Social Care in the United Kingdom, estimates that vaping is 95% less harmful than smoking. Research suggests switching to a vaporizer can reverse respiratory symptoms caused by traditional methods of cannabis intake. It's important to note that when you vape with a temperature above 392°F(200°C) you risk inhaling benzene and other toxic by-products. WAY less than with smoking, but still more than you would if you stayed under this temperature limit. It's also important to note that if you get a vaporizer from an unregulated market or unauthorized dealer, you risk getting clones or vaporizers with very low-quality and sometimes even dangerous materials, like lead solderings near the heating element. Inhaling lead is extremely toxic. When buying a vaporizer always make sure that you get it from an authorized dealer! This might sound strange. but getting an ‘expensive' vaporizer will actually save you large amounts of money in the long run, especially if you're a heavy user. By using a vaporizer, the vapor goes directly from the herb chamber into your mouth without having any chance to dissipate into the air. If you light up a joint, you will waste cannabinoids because of the smoke that simply dissipates into the air (and can never be retrieved) from the tip of the joint. With a vaporizer, you will use less herb to get the same level of medication. Over a period of time this can add up into the $1000's (depending on how heavy of a user you are). What’s more, vaporizing marijuana with the right temperature, leads to an even higher concentration of cannabinoids as found in this study. A higher concentration of cannabinoids not only increases the protective qualities of your vapor but also gives you more bang for your buck. Although smoking pure marijuana tastes well, with a vaporizer it's much easier to taste all the subtle differences in flavor between different strains. Because there are almost no toxic by-products, the taste is purer /cleaner. Plus, you can really control your flavor with the temperature settings of your vaporizer, really fine-tuning your vaping experience. One thing that I absolutely hate about smoking is the smell it leaves you with. Especially in a confined space like a living room over a longer period of time, smoke can ruin furniture. 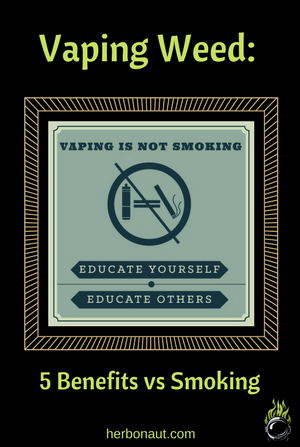 The benefit of vapor is that it dissipated 10 times faster into the air than smoke. Smoke keeps lingering around for days in your clothes and furniture. Tar, which is a by-product of burnt plant material, sticks on surfaces and fabrics, and if not removed can stay there for years. Don't you hate it when someone is puffing his cigarettes right next to your face? Besides the fact that it's annoying as hell, it's extremely unhealthy as well. If you vape your weed, you won’t be poisoning anyone with second-hand smoke. This is especially important if you smoke at home. Because in a confined space like a room, the effects of second-hand smoke are even more disastrous for your health. It's true that doesn't give you the exact same high as a joint or big hit from a bong. Smoking has a stronger (not necessarily better though!) effect on the body and the mind, giving you the typical sludgy lethargic feeling. It's that well-known feeling of tiredness, that in some cases keeps you locked to the couch. One possible explanation for this is that with smoking you absorb a lot of toxins that have an (negative) effect on your body and mental state but give you a ‘buzz' that you might mistake for the ‘high'. According to most users vaping weed gives you a much cleaner high, a high in which you are not numbed and glued to your couch. Instead you will experience a high where you feel more energetic, clean and stimulated. What’s more, when you choose the right vaporizer, the potency and density of your vapor will be so strong that you will get very strong effects, except in a much cleaner and clear-headed way. It ‘s also true that low-quality vaporizers, or more generally, vaporizers making use of low-quality materials suboptimal for vaporizing, severely alter the taste of your weed in a negative way. High-quality vaporizers on the other side will give your marijuana a much cleaner and flavorful taste than smoking. High-quality vaporizers only use materials which are optimal for preserving the taste of your herb, or of such a high quality that it won't negatively affect the taste of your herb in a way that's noticeable. With a high-quality vaporizer, you will taste all the delicate and subtle differences in flavor between strains, and you will be able to pick the strain which tastes the best. It's hard to give a general answer to this question as in general this depends on the vaporizer you have. Preparation time with any on-demand vaporizer is usually just 10-20 seconds. Session-vaporizers need a little bit longer, usually around 1 to 3 minutes. Cleaning really depends on the brand and type of your vaporizer, with some vaporizers needing virtually no cleaning, and other vaporizers needing more extensive cleaning (glass parts, whip, bowl, screens, etc.). Because vaporizers truly can be a technical jungle for any cannaseur new to vaping (in my opinion you can't be a real cannaseur if you're not vaping…but that's a discussion for another time). This guide is your machete, with which you'll clear up the technical jungle and only the bare essentials will be left…so no vaporizer will have any secrets left for you. Click the share button below to share this article on your favorite social media platform. Or follow us on Facebook/Instagram.